The December average price per gallon of regular gasoline in California dropped 23 cents from November to $3.40. The California premium above the average for the US other than California ($2.26) rose to $1.144, a 50.6% difference, as fuel prices dropped faster elsewhere. California’s fuel regulations and the isolated market created by those regulations continue to push the state’s cost premium up higher—a cost-of-living factor that in particular falls on lower-wage workers as they are forced to commute longer distances in order to find housing they can afford. In December, California had the 2nd highest gasoline price among the states and DC, behind only Hawaii. Californians paid $1.48 a gallon more than consumers in Missouri—a cost 77% higher for the same tank of gasoline—the state with the lowest price. The December average price per gallon of diesel in California dropped 17 cents from November to $3.88. The California premium above the average for the US other than California ($2.99) remained essentially constant by easing to 88.2 cents, a 29.5% difference. In December, California had the 2nd highest diesel price among the states and DC, behind only Hawaii. 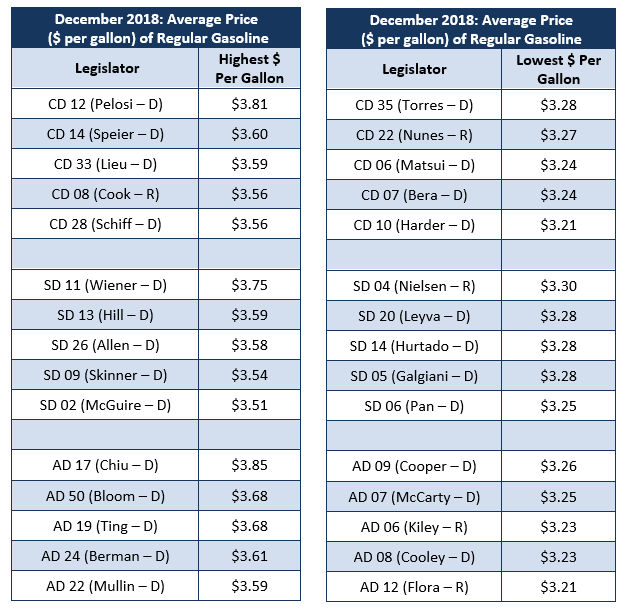 The cost premium above the US (other than California) average price for regular gasoline ranged from $1.04 in the Sacramento Region (average December price of $3.30), to $1.28 in Central Coast Region (average December price of $3.54). California average Residential Price for the 12 months ended October 2018 was 18.84 cents/kWh, 50.7% higher than the US average of 12.50 cents/kWh for all states other than California. California’s residential prices remained the 7th highest in the nation. For the 12 months ended October 2018, the average annual Residential electricity bill in California was $1,230, or 23.7% higher ($236) than the comparable bill in 2010 (the year the AB 32 implementation began with the Early Action items). In this same period, the average US (less CA) electricity bill for all the other states grew only 4.4% ($60). Electricity use, however, differs significantly across the state, with estimated 2017 household use up to 68% higher in the interior regions compared to the coastal regions. As a consequence, the lower income interior regions pay a disproportionate share of the growing cost from the state’s energy policies. For the 12 months ended October 2018, California’s higher electricity prices translated into Residential ratepayers paying $5.7 billion more than the average ratepayers elsewhere in the US using the same amount of energy. 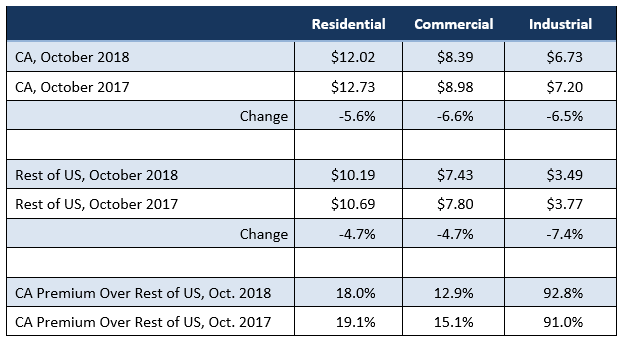 California average Commercial Price for the 12 months ended October 2018 was 16.32 cents/kWh, 61.1% higher than the US average of 10.13 cents/kWh for all states other than California. California’s commercial prices remained the 5th highest in the nation. California average Industrial Price for the 12 months ended October 2018 was 13.27 cents/kWh, 102.0% higher than the US average of 6.57 cents/kWh for all states other than California. California’s industrial prices remained the 6th highest in the nation. For the 12 months ended October 2018, California’s higher electricity prices translated into Commercial & Industrial ratepayers paying $10.4 billion more than ratepayers elsewhere in the US using the same amount of energy.